For years, we as marketers have been using demographics as a proxy for people who might be interested in our products. 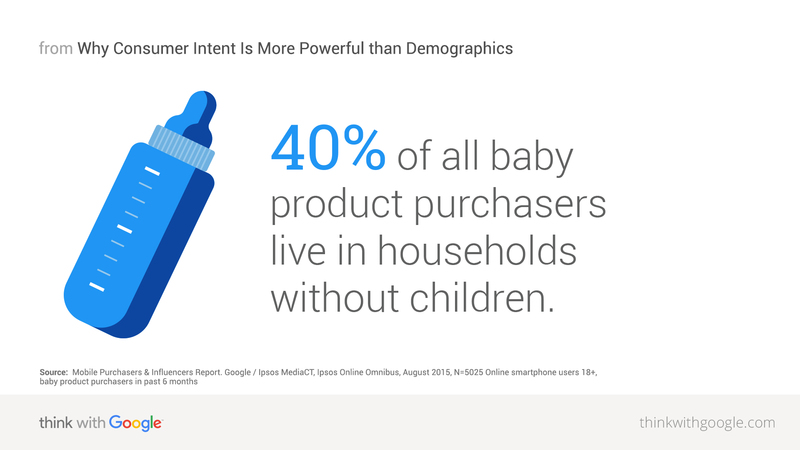 But our research shows that marketers who try to reach their audience solely on demographics risk missing more than 70% of potential mobile shoppers.1 Why? Because demographics don’t help us understand what we really need to know—what consumers are looking for in an exact moment or where they are looking to find it. Intent beats identity. Immediacy trumps loyalty. When someone has a want or need, they turn to their smartphone for help—whether it’s a karate newbie watching an expert do a move on YouTube or a mom looking for the best deal on a pair of sneakers. When a need arises, people turn to search and YouTube to look for answers, discover new things, and make decisions. We call these intent-filled moments, micro-moments. And they’re the best opportunity marketers have to connect with people at the exact moment they are looking for something. Understanding consumer intent and meeting their needs in the moment are the keys to winning more hearts, minds, and dollars. While demographics will always have a place in the marketing playbook, the brands that understand and respond to intent are better positioned to be there and be useful for all of their potential customers, not just those that fit an age and gender profile. Consider video games. You might think video game shoppers are mostly young men hunched over a bag of chips in their parents’ basement. 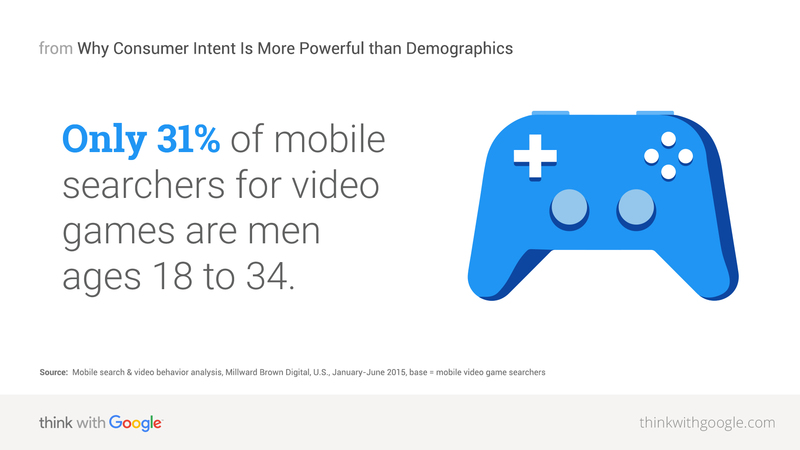 But the data shows only 31% of mobile searchers for video games are men ages 18 to 34.2 Target demographically and you’d miss out on the other 69% of mobile users who are explicitly expressing interest in buying the next big game. And if you’re a video game marketer looking to reach those in your category with video ads aimed at men ages 18 to 34, you’d miss out on 71% of the potential shoppers who are engaging with relevant YouTube content.3 That’s because on YouTube, which is fast becoming the new buyer’s guide and owner’s manual for games, mobile users are watching video to learn how to do things and explore their passions. But these people aren’t all the same. They’re arriving with various intentions. Some want advice, others seek inspiration, and others want product reviews. As you can see, if you want to reach this valuable audience, demographics alone won’t cut it. Marketers who consider intent from the onset are primed to win consumer hearts, minds, and dollars. Home Depot is a real-life example of a brand that understands the power of intent. Years ago it figured out “do-it-yourselfers” were turning to their phones—especially YouTube—to learn everything from “how to tile a bathroom floor” to “how to build an outdoor fire pit.” So to be more useful in these I-want-to-do moments, Home Depot built a content marketing strategy centered around “how-to” videos on YouTube. Today the collection has hundreds of videos, with the top 10 videos each reaching a million views or more. The full Home Depot “how-to” collection has received more than 48 million views. When your potential customers turn to Google and YouTube in their moments of need, make sure you are there. Use Google Trends to explore search trends and queries in your category to understand what consumers are looking for. Make sure you are there and useful in these moments of intent. Provide local inventory information so they can see what’s in stock nearby. Offer the ability for consumers to seamlessly check out with an “instant buy” button.